As a Virginia Wine Pass cardholder, you and a guest, will be able to enjoy exclusive freebies and upgrades at Virginia’s premier wineries and cideries. Unlike a coupon, with the Virginia Wine Pass you’re able to revisit the same wineries as often as you like; you’ll continue saving for as long as the pass is valid. Hop on the Vintage Piedmont, Monticello, Shenandoah Valley or any other of the region’s 24 scenic wine trails. With the Virginia Wine Pass, you’ll be guaranteed member-only perks while exploring historical sites and sampling artisanal wines and ciders. The Virginia Wine Pass can pay for itself! When you download the Virginia Wine Pass App (available directly through your smart phone only and compatible with both Apple and Android) and purchase a membership, your “card” is delivered instantly to your smart phone. You and your guest are immediately set to enjoy all the perks your membership affords. Just show your digital card in the tasting rooms of our 100+ partners, all listed within the app itself, to enjoy your perks. 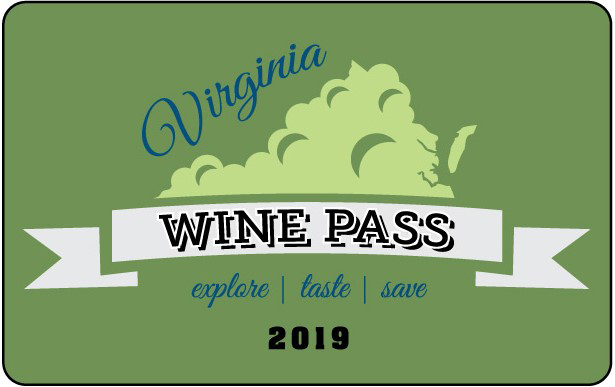 The Virginia Wine Pass card can be purchased on our website. It is a physical membership card that will arrive via USPS. We ship orders within 1-2 business days. Purchase of the Wine Pass card does not allow you to have a electronic version of your membership via the Virginia Wine Pass app. You may still, however, enjoy the free features of the app including maps, winery offers, and events. To redeem your membership perks, simply present your Virginia Wine Pass in the tasting room of one of our 100+ partners. The Virginia Wine Pass card is valid for one calendar year; it expires December 31st of the respective year. The wine pass arrived by mail just a couple of days after I ordered it, and I was able to use that very weekend at several winery tasting rooms around Charlottesville. It was really worth it! Thanks! So glad I got this card! The Virginia Wine Pass is a great value—for us, it paid for itself after the first winery visit. My friends and I have really enjoyed exploring the Virginia wine country with the pass and look forward to doing the same next year! The Wine Pass has made us “get out there” and explore new wineries! We just love using this pass! Each Virginia Wine Pass membership is good for two people. It is non-refundable.